Well the time has come to reveal to the world the GeoJellies. The first batch has arrived safely. Here are a few quick pics. We have 44 flavors in at this time. 20 more on the way. We are waiting on the second batch from the chef. We thought we would reveal these so you could get your sugar fix in the meantime. Once we have all the coins on hand there will be a very special auction coming up. For each flavor made there were 2 gold coins made. ! will stay with the owner of that flavor. the second coin will be the auctioned coin. This will be the one and only chance of owning all the flavors, and at the same time giving back to a cacher's family. There will be more details forth coming when we are ready for the auction. Until then, please enjoy. * If there is enough demands to do a third batch (meaning 500 coins) I could be persuaded to do this. Cool, coins how many coins were made? It says 44 flavors but how many coins in each flavor? besides the 2 gold ones. Are these micro coins and does each flavor have a different Icon or is the icon the same for all flavors? Well done, cant wait to see them out and in circulation. Each person had the choice on how many of each flavor they wanted with a minimum of 10 coins. In total we will have over 1500 coins in production. There is but one icon to rule them all. Is there a list of flavor somewhere and who has each flavor. Would like to get a fe of these. Will have some geotags to trade or some other coins. Very cool.....I have a trade set up with the owner of the grape one. But how can I find the owner of a blue one??? Will there be a list of people with the colors they have to make trades?? Hey, that's my elbow in the first picture, and you failed to secure my permission to depict any of my body parts in your advertisments. Far too much copyright infringement going on around here nowadays. I'll accept one Radioactive Coconut GeoJelly as compensation, or I'll call Richie Sambora. Man! I wish I could zipped out to pick up our coins tonite...they look awesome! I have the lovely Peanut Butter one. I will be looking for any XXXLEs like a Moun10bike V.1 . I am excited to get my coins! We will have Mango and our girls will have Orange Juice. Available for trades! A close up shot would be nice ! Would love to see how these turned out. Ooo I want! Will have to find someone to do a trade! I don't have any close ups yet. They just came in tonight and I have been busy double checking spelling, quantities, and such. I will get something up soon, or maybe Yime will. I will work on a list to condense who has what for trades. We still have a second batch of coins coming so bear with us. Hey if you are in for more (the next 500) I would love to get on that list. I have two versions of Kiwi Fruit flavor and a XLS Radioactive Kiwi Fruit flavor coins. Soooooooooo excited!!!! I had things come up that prevented me from getting in on the first one, so I might have to see if I can get in the second. 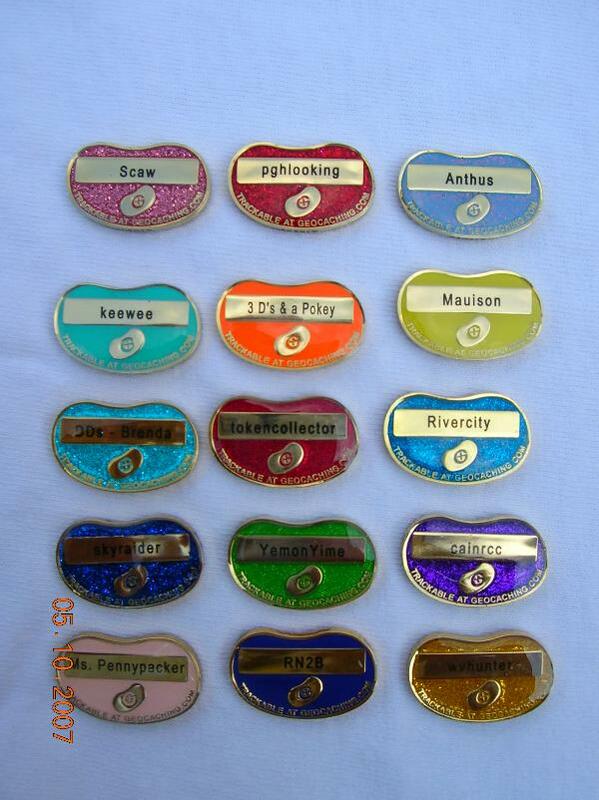 Anyone who has a Jellie, I'd love to get one. I've got records to trade at the moment. Depending on when the second batch is made and all if I will join. Another run will not be till after GW5 and everyone has their coins in hand. I need to finish this round to completetion first, then we will see if there is enough interest to get another 500 done. Heather is going to love her coins, they turned out great, saw them in person this evening. All the coins look great, it's going to be tough making trades for some as I didn't get many coins made myself. I can't wait to get my sticky little paws on mine. Thanks to all involved with the project and making it possible. Can't wait to see some close ups. Thanks for your hard work, pghlooking. I'll have Berry Blue GeoJellies for trade. JellyBelly Jelly beans = Addiction!! Oooo ! ! I see my GrapeJellys 5th row down 3rd. from the left side in the second picture.I will have a few of them for trade as there was only 30 Grape coins made. Thanks GeoSmurfz for the trade with me for one of your new personal coins. Now to set up some other trades. Also thanks to pghlooking for everything you have done to get the GeoJellys minted. We have the "Bodacious Berry" flavor. Only 11 minted. It's one of the blue ones but I'm not sure which one in the picture. The color is R-Y Blue Glitter. We will have only a few to trade since only 11 were minted and will only be making trades in person at GW5 and other events. Thanks to pghlooking for all your hard efforts on this project. These turned out awesome! I cannot wait to get my hands on mine. This is soooooooooo exciting!!! I can't wait to see them & get my paws on mine!! THANKS so much Jim for doing this!!!!! I know it turned into a lot bigger project than you expected!! They certainly look very cute from a distance! You & Yime are lucky to see them first hand! How do you order your own flavor now? Also how much would the coins be if the 3rd batch is done, I would want 25 coins plus the gold coin for a total of 26. Phooyeee I can't remember what kind of bean I was in for at the beginning, if the person that got it knows ... could you contact me and maybe we could do a trade? 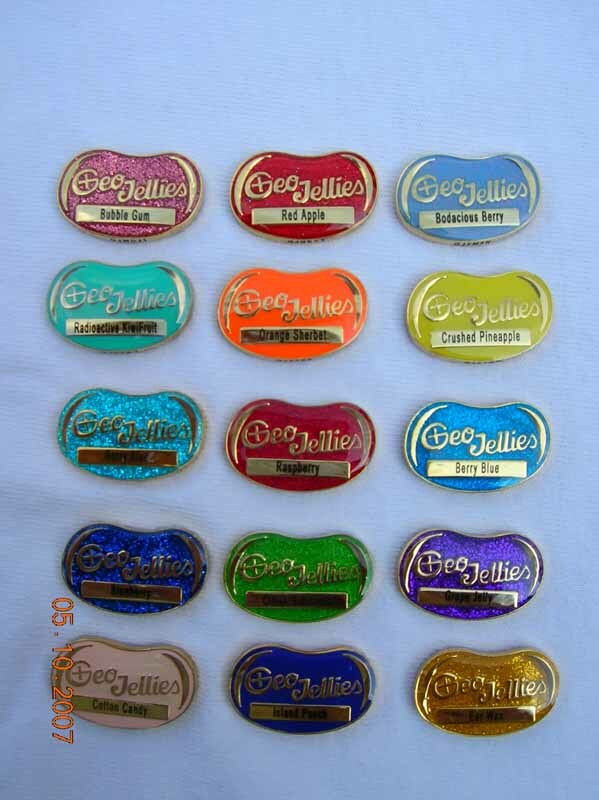 Also, there are only 6 flavors left I believe so that would mean many old jellies would have to re-order some and 6 new people like me. What flavors are left anyway? I saw the samples...got to actually hold them...they are AWESOME! A third run is not at present being done. It will be handled in a different thread when this thread and these two runs are completed. While I appreciate your interest, please keep this thread on topic about these coins. I don't want to start discussing a new run in this thread, and alot of the assumptions are not true at this point. Once everyone has their coins in hand, I will open a thread about doing the next run. Until then please enjoy these ones. Thanks. wow oh wow they are brilliant. Thank you for doing the coins the stress must have been unreal but wow are they worth it. My poor postman is gonna be sick of me asking if there is a package for me. They all look so... so... TOTALLY AWESOME!! For those who are interested, we have Caramel Corn, done in two colors. We can handle a couple of trades, but we probably won't have our coins for a while yet, as their in the second batch. When this project started I was thinking - they will make anything into a coin............... But I must say they are sure cute!!! A good job was done on them for sure! I would like to trade for a couple if anyone is willing. How on earth did I miss out on being in this great project??? Can I reserve gumleaf flavour and suitable colour if you do some more, please? So who got the Dr. Pepper flava flav? Can I reserve grape colour if you do some more, please, please, please? What size are these? Micro's? Please contact me. I am not looking for a whole set but would like some. Mike, With all the hard work you've put in to the GeoTag project I will gladly trade with you. I have a nice candy Red Apple one to trade you in person at GW5 for a micro pepper if you would be so kind. You wanted a list, so here it is. There are 2 coins missing from the list that I know of. One from someone who asked me not to post their coin, and another as I bought it for a gift of thanks to someone and I wanted them to not know till they receive it. Other than those 2 coins, this is about as complete as it gets. Can you post the ones that have not been taken? Will you be minting additional flavors after GW5? I would be interested maybe in Jalapeno flavor.